That moment when you meet someone and you just know. This was the case when I met Xavier and Sonia. 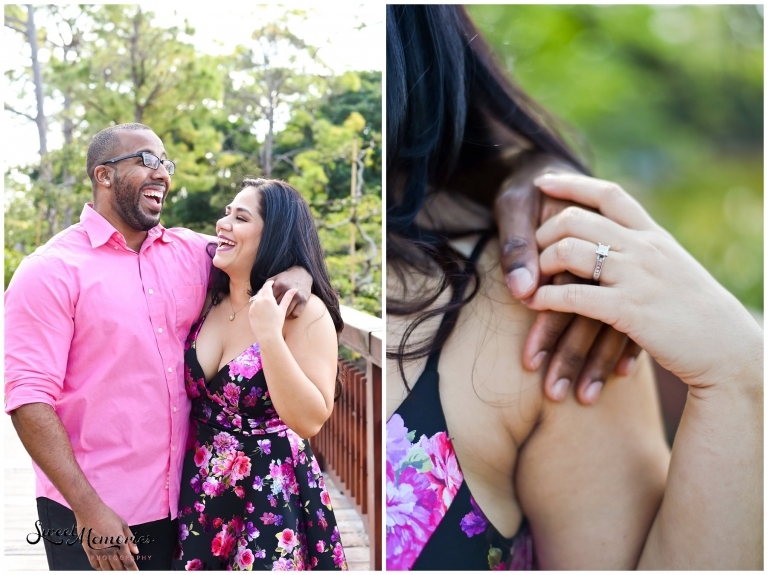 The stars aligned and the three of us were introduced, leading to their Morikami engagement session and, soon, their wedding! From Disney and Harry Potter to working out and being foodies, it’s like we are the same people! You can imagine how awesome our initial meeting was and how perfect their September wedding will be! When you meet these two, you can’t help but notice a few things. One: What a beautiful couple they make. Two: How much they truly love each other. Three: They obviously work out! Aside from the physical stuff, they are also two of the nicest people ever. They are genuine, kind-hearted, and just plain awesome! If the above wasn’t a good enough prelude for how their engagement session would be, let me sum it up for you. Perfect, perfect, perfect! The weather was amazing (not too hot like most Florida days can be). Morikami‘s gardens were gorgeous, as they always are. And Sonia and Xavier were perfect (there’s no better word). As stated before, they obviously love each other. Just the way that they look at each other, can make each other laugh, and are always in sync (even their walking strides) … it’s amazing. I absolutely adored working with them and getting to know them better. I love this dance sequence! This is something that the hubs and I do, too. Girls aren’t the only ones who should have fun and twirl! The guys should be included, as well!! And the award for best dressed goes to …. Now, if you haven’t been to Morikami in Delray Beach yet, you must. It’s definitely one of my favorite places for an engagement session or wedding. In fact, Sonia and Xavier were contemplating having their wedding here but due to personal reasons and logistics, they chose not to. There is just such a variety of scenery, as you’ll notice as you scroll through the pictures. Bamboo, bonsai trees, lakes, small waterfalls, Japanese style buildings, Japanese-inspired gates, etc., they have it all! Because who doesn’t love a good dip?! Sonia and Xavier’s outfits make me so happy. I always have one picture from every session that really stands out to me. It’s personal preference and for me, that picture makes an impression. That picture would be the one below. Standing in the background, behind the trees, I just allowed them to be themselves and interact as they normally would. I am obsessed! Doesn’t this image just scream love? Pure love 😍 For the second half of our session, Xavier and Sonia did an outfit change. Couples who work out together, stay together! These two do just that! Even better, they challenge each other (as you can tell by the pictures below 😂) Take note of her cool necklace – LOVE!!! A little friendly competition never hurt anybody! If you’re newly engaged and looking for a photographer, we’d love to hear from you! Check out our work at our website and contact us!